Art Nouveau Disco Goth! Rebelicious Magazine cover: Angelica Brigade hair flowers, Vaute Couture dresses. 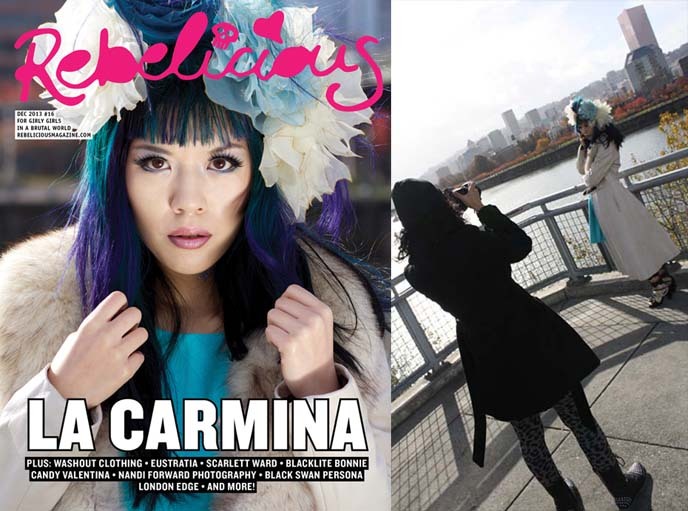 While I was in Portland, I did something special… I shot a cover and spread for Rebelicious Magazine! It’s an honor to be the face of their winter issue, which came out today. There’s more happy news: my Budapest travel video and slideshow are published here on Business Insider, and the reaction is huge — 150,000 views and counting! I hope you’ll take a minute to watch, and that you’ll enjoy the photos below. My team and I took these images in Portland, Oregon, mainly around Steel Bridge. I love shooting outdoors in different cities, as I feel these types of photos best convey the feeling of a place. First Mate Naomi Rubin took behind-the-scenes and additional photos, which I’ll share in an upcoming post. Aren’t these velvet dresses adorable? They were lent to me by Vaute Couture, an eco-conscious and vegan fashion label. 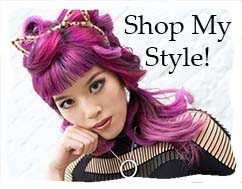 The latest collection is inspired by Sailor Moon — the Jpop colors and cute cuts were a perfect fit for me. You can purchase this Kristina dress, a Constellation dress and more from Vaute Couture’s website. 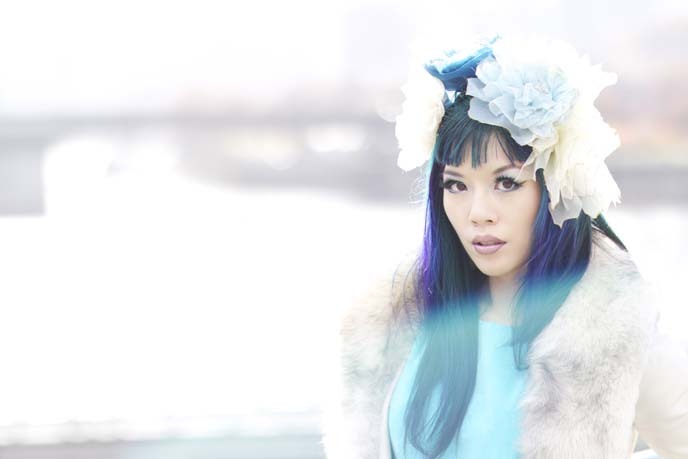 My silk flower hair accessories were created by hand, by Angelica Brigade. The accessories can be pinned or clipped on, and arranged in any way — including stacking them to make a flower crown. Angelica Brigade customized the colors to match my new hair! 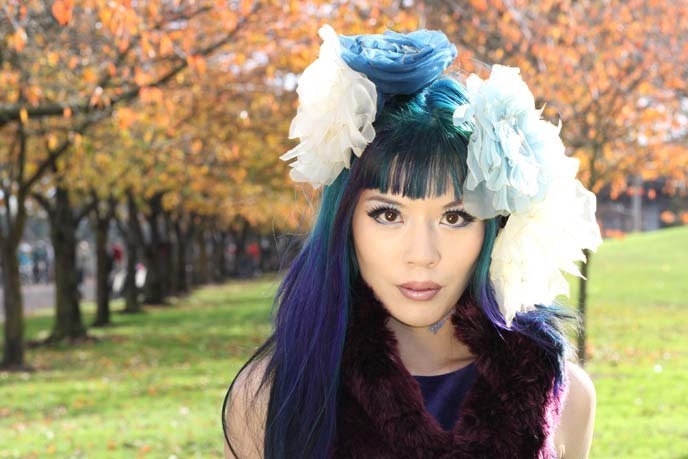 Speaking of — my mermaid hair color is the work of Stephanie Hoy of Avant Garde Hair in Vancouver. The ombre effect is a combination of turquoise, blue and dark purple. My coat is a disco-pimp dream, isn’t it? It’s vintage Alan Cherry (Toronto designer brand), from Portland store Hattie’s. Once I saw the long white leather panels and faux-fur trim, I had to have it. My makeup is 100% Annabelle Cosmetics, a Canadian company. I’ve been wearing them the entire time in Portland. As you might know, I’m a big fan of Art Nouveau, and wanted to do a shoot inspired by this aesthetic. It’s an honor to shoot for Rebelicious Magazine, a publication “for girly girls in a brutal world.” They celebrate alternative style, underground culture and individuality — all things I stand for. 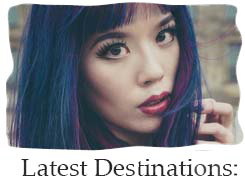 The winter issue features an interview with me, so you’ll have to pick up Rebelicious Magazine here for the full scoop! Which of the two outfits do you prefer? It’s fun to switch up my wardrobe, in order to match my ever-changing hair color. No animals were harmed to make this faux fur scarf. I got it at Holt Renfrew. Here is the shot that ended up being the magazine cover. The back of my Vaute Couture dress has a cut-out star. Portland’s autumn colors were too gorgeous not to shoot. Lens flare is always welcome, especially when it reflects teal like my dress. Thanks to Rebelicious Mag and my team for this wonderful project. 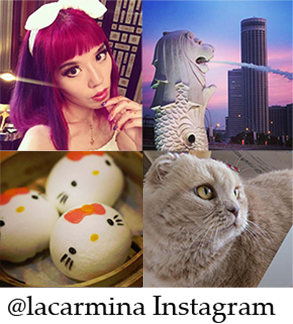 For behind-the-scenes shots, jump over to Rebelicious’ Facebook page. Don’t forget to read my interview and order a copy of this issue. PS: My Budapest travel video is released! Watch as I visit hipster bars, rock out at a surreal music festival, and taste Hungarian food. I hope the Mission Impossible running scene makes you smile. See my shenanigans above and on Business Insider. Thanks to all of you, for making my creative pursuits possible. Love the faux fur scarf! Thanks for sharing. Juhéé! Minden magyar írjon egy angol kommentet, hogy jujdeyoh Budapeest! So glad you are on the cover!!! You are a dreamy dream boat! Beautiful pictures! Your hair is amazing!!! I love your hair so much! Turquoise and purple are my favorite color combo. Aww thank you so much!! <3 I will keep it like this for a while. YES take a Taste Hungary tour! Just so you know: in Hungarian, then letter “s” is the equivalent of the English “sh”, and “sz” is “s”. Budapest is pronounced Budapesht, Sziget is pronounced Siget and dobos(torta) is pronounced dobosh. It’s no difficult, you already know the sounds. Oh, and lángos is a fried flatbread, distinct from other flatbreads. Buy it with garlic and tejföl (a sort of very thick sour cream) on the Balaton shore from a caravan converted from a Soviet van for the authentic experience. Loved these photos, my friend. Stunning. I’m so happy to hear! Miss you! Love the look! And love your hair!